This high quality non-ionic surfactant greatly enhances the effectiveness of Rodeo or Shore-Klear herbicide as recommended by the manufacturer. The surfactant helps penetrate the natural waxy tissue barrier of plants. 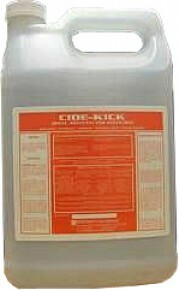 Cide Kick is automatically included for free with the purchase of Rodeo or Shore-Klear herbicides. Also aids duckweed treatments made with Weedtrine-D or Reward herbicides. 1/4 to 1/2 ounce per gallon of water. * Consult Label for Exact Doses & Important Application Directions. The Cide Kick Surfactant Product Label is available for download in pdf.